I am currently obsessed with the Euganean Hills. This is a group of lush peaks rising gently from the flat as a pancake Venetian plain. 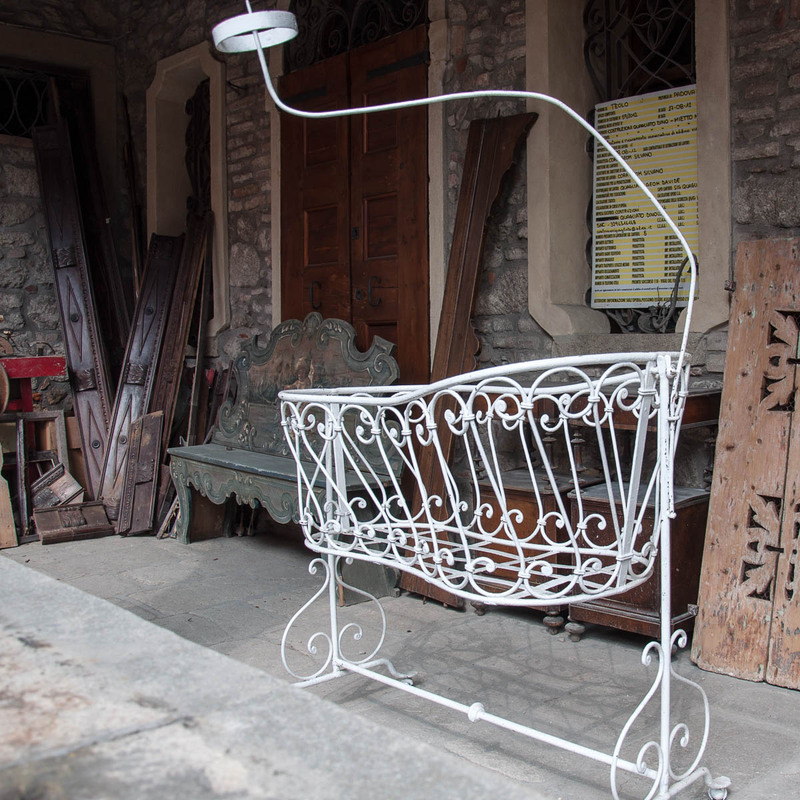 They are only a short drive away from Vicenza in the direction of Padua. In the past two and a half years we had driven many times past them, by them and around them on the way to one or other of the many picturesque medieval towns snuggled at their foothills. It’s just that we had never driven through them and up them. Gosh, in the space of a few short paragraphs this is the second time that I mention that I am obsessed with something and I fully realise that this, perhaps, makes me sound a bit mad. The thing is, though, that I can’t resist picking a few of those touristy brochures, leaflets, flyers and booklets every time that I come across a colourful display advertising local attractions and things to see and do nearby. The result is that I have accumulated an enviable collection, which is not only kept in a dedicated and overspilling drawer unit at home, but it can easily rival the selection of promotional materials in any local Italian tourist office. It is a guilty secret of mine, but it comes in very handy when I am out of ideas as to where we should go and what we should do on a weekend or a day off. You know, we try to get out and about as much as possible and explore off the beaten track as much as we can. But after two and a half years sometimes it feels like we have already been everywhere within an hour’s drive from Vicenza. Well, on one of those uninspired mornings I just have to open my drawer unit, pick a brochure at random and, voila, there is always another little town, hamlet or natural sight just a stone’s throw from us that we haven’t seen yet. This is exactly what happened two weekends ago. I plucked a tiny leaflet out of the magic drawers and it said: Euganean Hills. The picture showed a green place with rolling slopes and picturesque villages and the copy spoke of volcanic hills formed underwater 35 million years ago and nowadays clothed with cherry orchards, olive groves and vines, which had inspired such illustrious minds as Petrarch and Percy Shelley. Yes, he has this impression, I don’t know where he got it from, that it takes me ages to get ready. Anyway, in an uncharacteristically for me short amount of time we were in the car and we had set off. For once the marketing spiel was not an exaggeration of the actual truth. For the Euganean Hills turned out to be a place I would love to return to as many times as I could. The hills, when you see them from afar, are usually covered by a constant haze giving them a mysterious halo. Drive through them and you will find yourself in a green paradise criss-crossed by hiking paths and spiraling narrow roads on the sharp turns of which you need to beep to alert the oncoming traffic. Green vineyards hurtle down the slopes and gorgeous views open up towards the nearby towns and cities of the Veneto. 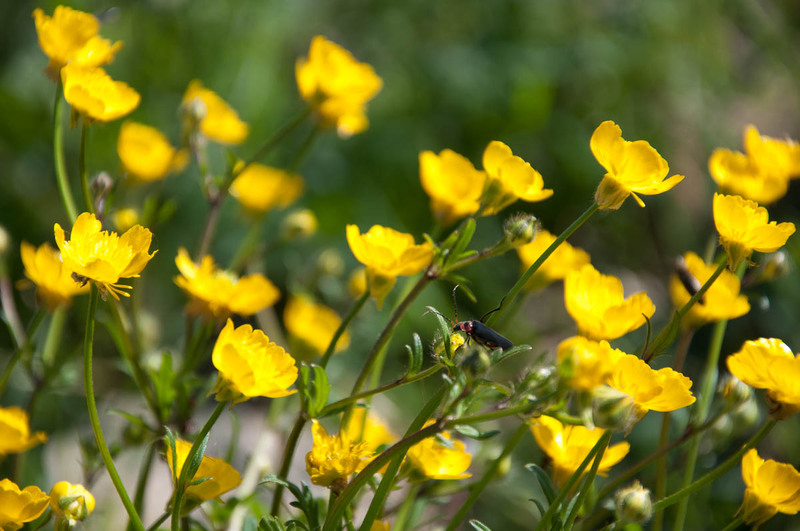 Yellow buttercups and nettles in purple bloom carpet forest clearings and the sides of the roads. The Euganean Hills comprise about 100 elevations, which are from 300 to 601 m high, and all through them are dotted countless natural beauty spots, historical sights, cultural landmarks and culinary hotspots. 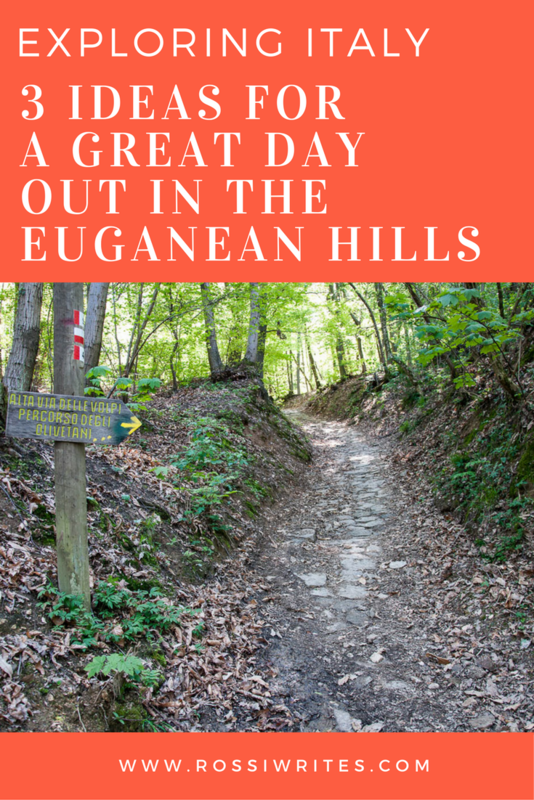 So, here are just three of them, personally tried and tested by me over the course of two weekends, to give you a starting point for your exploration of the Euganean Hills. Read on! You can visit all three of these places within the same day or spread them over a longer period of time. It is completely up to you and I am sure that along the way you will discover many more spots and sights to enjoy in this beautiful corner of Italy. Enjoy and don’t forget to spread the word. Right on top of the Euganean Hills’ highest peak – Monte Venda – you will find the ruins of an ancient monastery. First established in the 12th century by the monks of the Order of St. Benedict, in later years it became a sanctuary for the Olivetani monks until its final closure in 1771 by order of the Republic of Venice. Bathed by the Italian sun and enjoying glorious views over the Venetian plain and the surrounding hills, the ruins, even today, are a staggering sight to behold. Plus, the place is very peaceful with hikers spending their time meditating among the ancient stones or quietly picnicing with their children and dogs. Every first Friday of the month a mass is served among the ruins. On Sundays visitors can pray in the small onsite church which is located in the consecrated crypt. 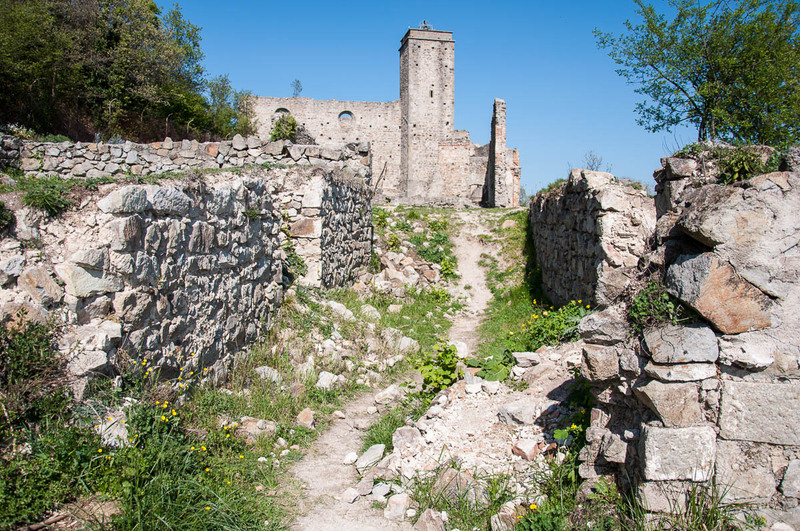 We reached the ruins of the former monastery following a half a kilometer hike through the woods. First, it took us about 40 minutes to reach the foothills of Monte Venda from Vicenza. Then we drove up almost all the way to its summit (which, by the way, is a fenced-off and off-limits military zone) where a wooden sign pointed us in the direction of the hike. Just like dozens of locals before us, we left our car in a small lay-by on the side of the narrow road. Then we simply followed the well signposted hiking path. The path is mostly rather steep, but at places a sturdy wooden railing is provided to help you scale it. Parts of the path were covered with stones reminiscent of an old Roman road. It took us about forty minutes going up with lots of little stops along the way to give our little daughter a chance to admire the wild flowers and to catch her breath. The descent back to the car was much quicker. As we reached the ruins of the former Olivetani Monastery around 1:30 pm (when the traditional Italian riposo starts), there were no people on the hike at all. Up there we came across about two dozens of people relaxing on the green grass. On the way back around 3:30 pm, we passed by scores of other hikers heading up the hill, so it looks like the place is rather popular locally. Apparently, there is a 6 km long hiking path called Sentiero Naturalistico G.G. Lorenzoni which leads up to the monastery. As we were with our little daughter, I gather, we were lucky to be able to start the hike only half a kilometer away from the ruins, which gave us a chance to visit them rather painlessly. 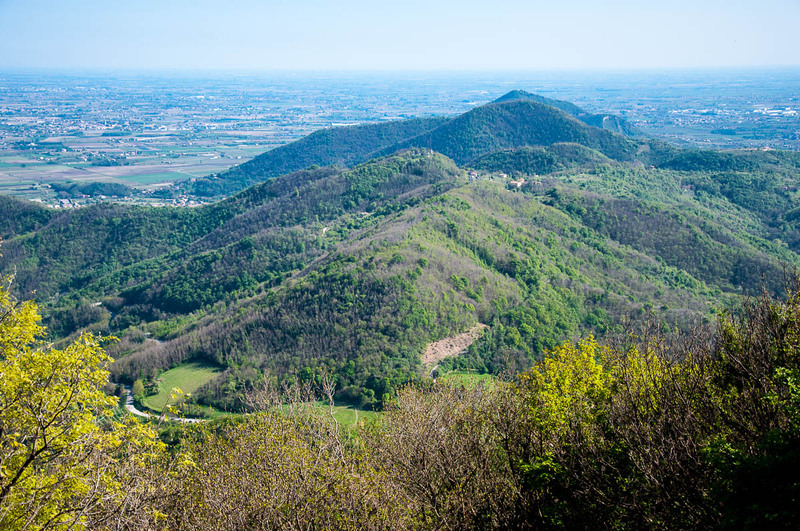 On the other hand, we were told that hiking the path in its entirety offers incredible views over the Euganean Hills and the Venetian plain, so this is something for us to do in the near future. 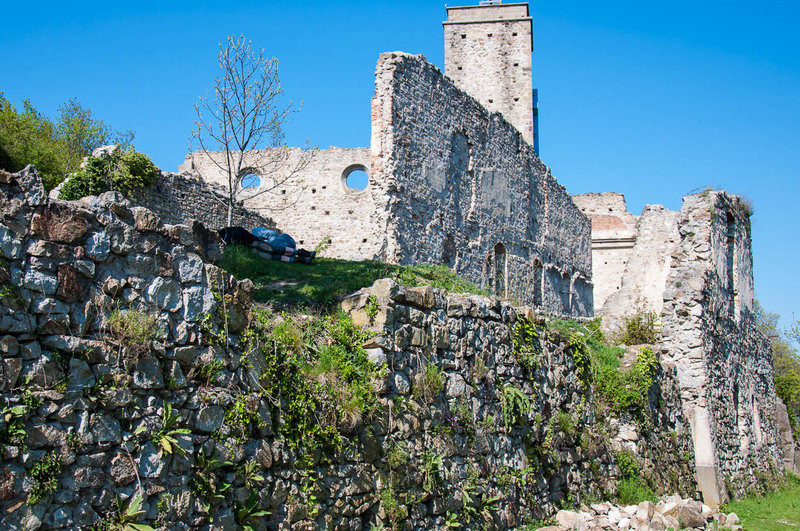 A hike up to the ruins of the former monastery is a great way to get some exercise in while, at the same time, admiring the natural beauty of the Euganean Hills and finding a little bit of peace and quiet from daily life. Plus, the most gorgeous surprise up there on Monte Venda for me was coming across a little patch of orchids in bloom. Interestingly enough, in Italy there are over 600 types of native orchids. About 20 of these can be seen in their natural habitat in the Euganean Hills. 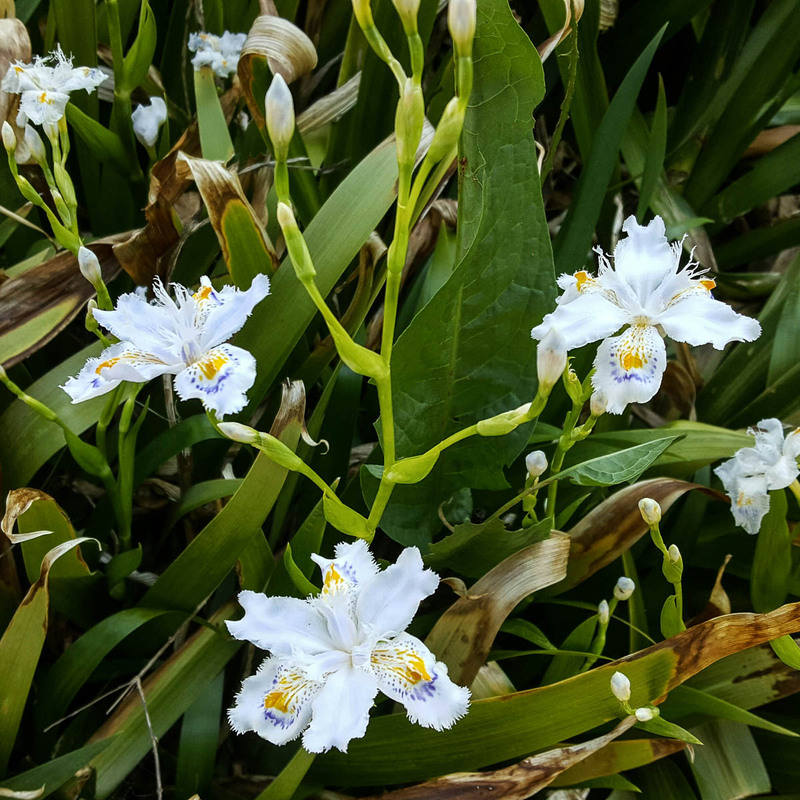 I was really hoping to see an orchid or two during our hike, so I was super excited to come across the patch shown in the pictures above. It was right next to the ruins of the former monastery and it was in glorious bloom. The orchids were incredibly beautiful and looked like made of cotton. Seeing them was definitely the highlight of the day for me. 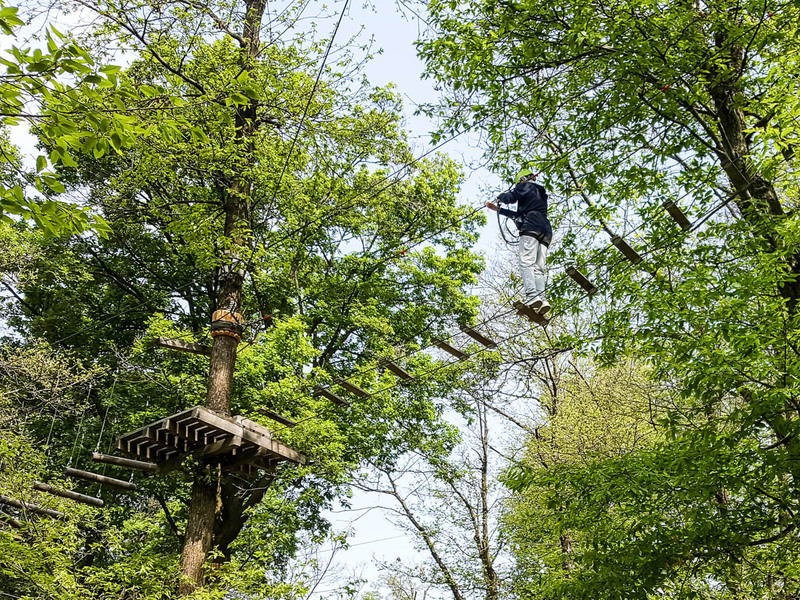 If you need more excitement than a gentle hike can provide, head over to the adventure park ‘Le Fiorine’ in the Euganean Hills. The park is set up in a lush forest and offers four different courses for people of different ages and abilities. 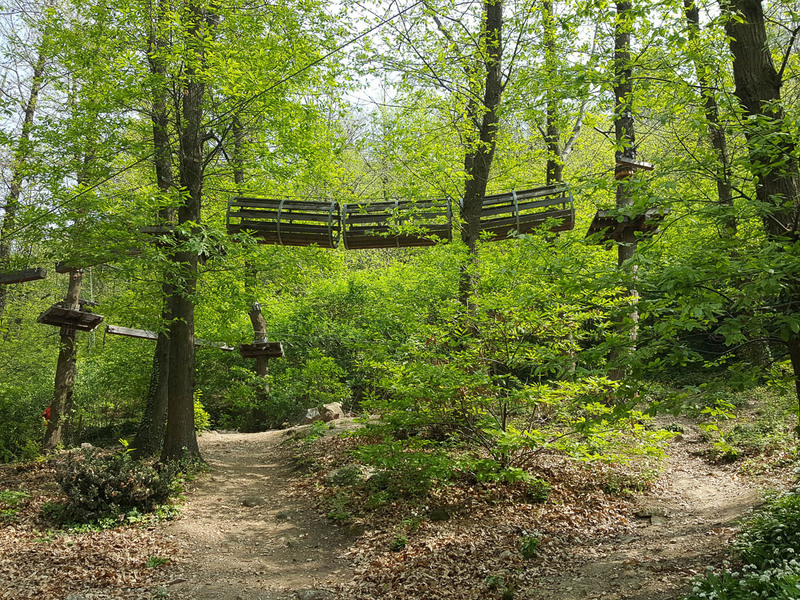 There are zip lines, bridges, zip walks and all sorts of obstacles which you need to overcome up there between the trees in order to complete the course and get back down to the ground. I had a great time doing the red obstacle course, which is of intermediate complexity. I must say that I am not very sporty at all and I had never up to that moment attempted anything of the sort. Still, after undergoing a short briefing (given in English) during which I was shown how to follow the course’s markers, how to use the carabiners and the pulley plus how to slide down the zip lines safely, I thoroughly enjoyed testing myself to the limit up there between the trees. Usually, I am OK with heights, so I didn’t find it scary or worrying being metres high up on small wooden platforms encircling the tree trunks. The zip lines also proved an easy to master feat (very enjoyable, too). The different bridges proved a bit more challenging, especially towards the end when I started to tire out with all the adrenaline coursing through my veins. The vertical net though was my downfall. Basically, I had to step from the nice and sturdy wooden platform onto a rope net which was hanging in an upright position between two tall trees. Holding onto the net and moving slowly ahead required a lot of upper body strength, which, suddenly, I realised I didn’t have enough of. I gave it my best shot slowly inching forward, shuffling my feet and my hands along the net. Soon though, I was taken over by sheer panic. Suddenly, I realised how high up above the ground I was and the net felt like an insurmountable obstacle. Honestly, at one point I was so panicked that I just wanted to scream back: ‘Shut Up!’ But I re-considered and just managed to utter: ‘Please, take the child away!’, as I didn’t want to declare defeat in front of my daughter. One of the park’s employees was just a couple of wooden platforms away from me, so he came to my rescue. He expertly hooked me up to his harness and then used the zip wire above us to pull us to the next platform. Once there, he gave me enough time to recover myself and humoured me enough for me to forget my bruised ego. Hence, I finished the obstacle course successfully by elegantly sliding down two more zip lines and reaching the ground in one piece. All in all, it was great fun and I am looking forward to another visit to this adventure park. Of the four obstacle courses there, the green one is especially designed for little ones. It consists of two zip lines to which the children attach their pulleys and then zip happily back and forth. It would have been great if more obstacles had been added to the green course to make it a bit more varied, but the zip line per se proved to be a huge hit both with our little daughter and the other children there. The other three courses – blue, red and black – are for grown-ups. You need to go through a short paid-for briefing before tackling any of these. Safety harnesses, helmets, carabiners and pulleys are provided both for kids and adults. You can find full details at the adventure park’s website here. The adventure park is in a very beautiful area of the Eauganean Hills. Nearby there is a picnic spot with barbecues, several hiking trails, chalets and hostels, so you can spend the whole day or even a whole weekend there enjoying yourself. There are many lovely towns and villages dotted around the Euganean Hills. Este, Abano Terme, Monselice, Arqua Petrarca, to mention but a few, are all beautiful and have a rich history to explore and learn about. If you want to feel like you are right in the heart of the hills though, head over to Teolo. 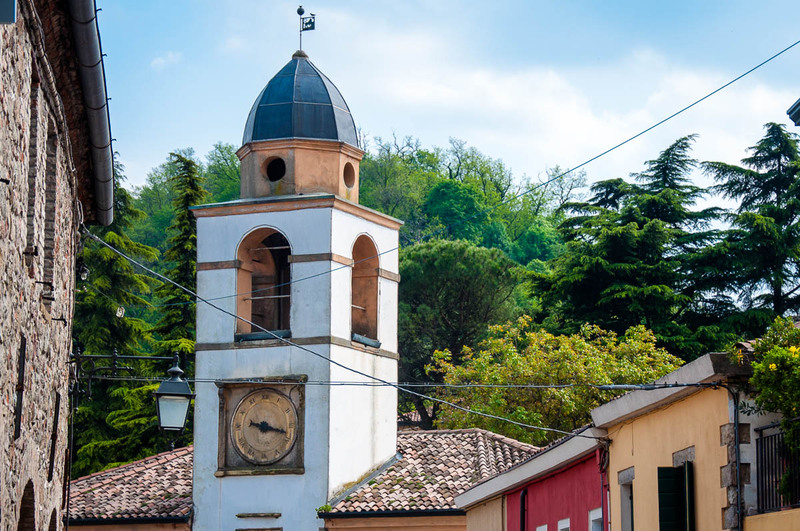 It is a charming little town with a medieval palace with a loggia and a clock tower in its centre. Through the centuries the palace was used by the Vicars – noblemen from Padua – who were nominated by the Republic of Venice to look after the administrative and military interests of the area. Nowadays, the palace houses a Museum of Contemporary Art named after the Italian philosopher and art critic Dino Formaggio. Several small churches and sanctuaries with interesting history can also be seen in and around Teolo. The best thing about the town for me though are the views it affords over the surrounding Euganean Hills. 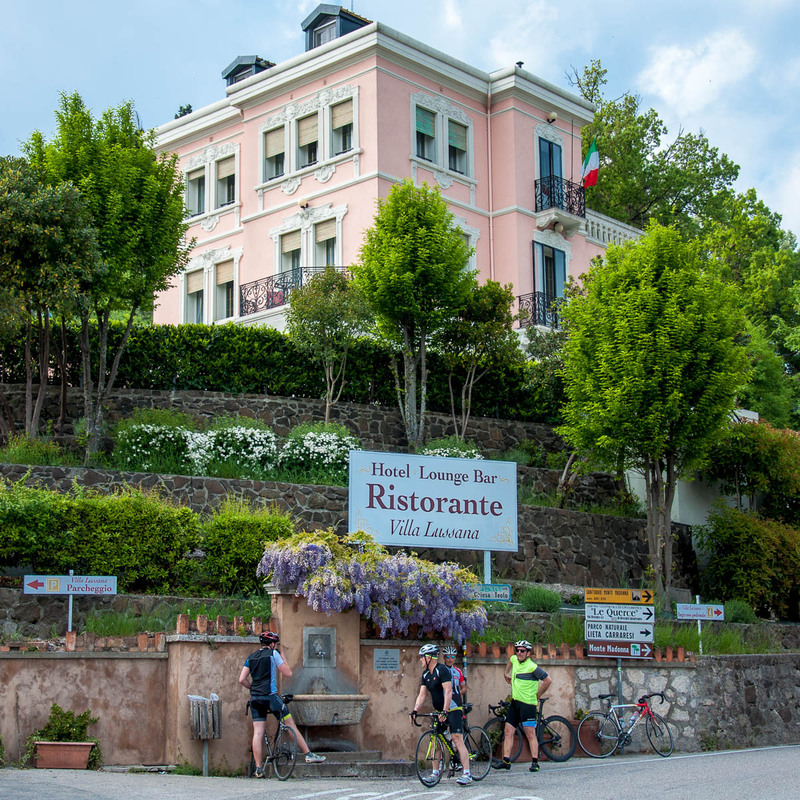 It is a very picturesque place and, with its old houses, blooming wisterias and good local food, it attracts many cyclists and bikers who spend their weekends traversing the hills in search of physical exercise and natural beauty. 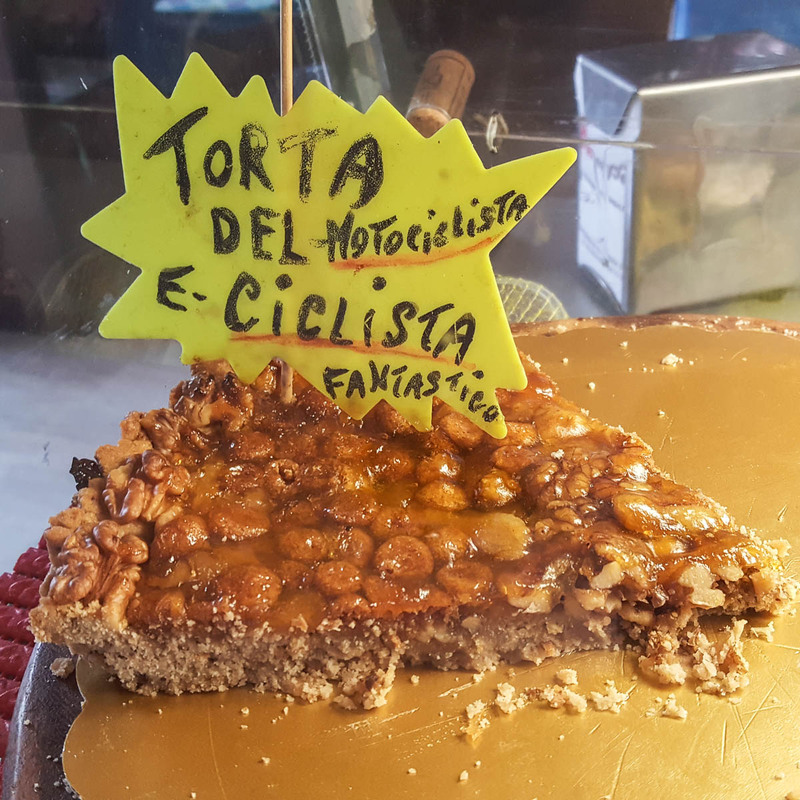 In fact, Teolo seems to be so popular among these two groups, that in the small bar in the centre of town where we stopped for some coffee and gelato, I had a chance to sample a local cake, called ‘The Cyclists’ and Bikers’ Cake’. As you need lots of energy when you cycle and bike, it had whole hazelnuts and walnuts incorporated into gooey sauce on top of a crumbly base. It was delicious! Well, these are only three ideas for things to see, do and experience in the Euganean Hills in the Northern Italian region of Veneto. If you have already been there, don’t forget to share with me your own tips and suggestions for places to visit there. If you are planning your first visit there, let me know which place(s) you visited once you are back. In the end, let me just tell you that only today I found in my huge stash of marketing materials three more brochures listing hiking trails in the Euganean Hills. I am sure that we will be back to this beautiful place many times from now until summer in order to get to know it even better and enjoy everything it has to offer. I am so please I found your post. I am planning a trip to Verona and surrounding areas in June 2018. You have given me so many ideas. I am travelling alone , so glad to have a visual of the areas. My children have bought me a ticket for Carmen at the Verona amphitheater. Can wait.